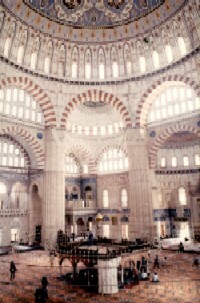 Sinan's is renowned for its success in the acoustic design of mosques is. Read further to discover the development of applications and technology covering acoustic knowledge within two great Mosques in Sinan. First of all, the calculations of the interior volume of all three mosques show us that there is a lack of sound power due to sound sources in the mosques. The maximum volumes of the rooms are given in Table 1. The Shehzade Mehmet Mosque, in spite of being the smallest of the three mosques, has an interior volume of almost 50,000 m3. Looking at Table 1, we can see that only massed choirs can produce the sufficient sound power for the room with that size of interior volume. 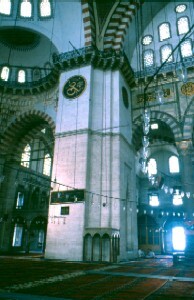 The muezzin's mahfil in this mosque is located next to the northwest pillar. It is evident that although there are cavity resonators in the dome, the sound energy will remain insufficient and the total sound energy of those working at the muezzin's mahfil will not be the equivalent of large choirs. It is realized that besides enlarging the interior volume of the Suleymaniye Mosque even more, Sinan tried to increase sound power by a number of sources. For this purpose, he placed the muezzin's mahfil near the mihrab, next to the southwest pillar and in addition, he added small mahfils (balconies) to the two north pillars. The data show awareness of the need for extra sound power during the design process of this mosque with interior volume approximately 88,000 m and the data also demonstrate the greatness of both the period's and Sinan's acoustic knowledge. It must be noted here, however, that there is also a lack of knowledge in this application. In such a large enclosed volume having more than one source located at different places and with the repetition of the sounds from the first and following sources naturally create duplicate sounds or even multiple sounds resulting in unintelligible sound or noise. For the Selimiye Mosque in Edirne, it is evident that Sinan made an effort to achieve a reasonable solution to the acoustic problem. For this purpose, he designed a total space for the interior of the mosque, not divided into spaces and reduced to the size of room. The interior volume of the Selimiye Mosque is approximately 75,000 m3 and, naturally, it is evident that the problem of the power of the sound source will arise. To overcome this problem, Sinan placed the muezzin's mahfil exactly in the centre of the total space. The dome and also cavity resonators are directly above the sound source. The resonator system that will diffuse the sound energy into the room, being close and having no effect of reflected sound, will take the sound energy directly from the source and diffuse it throughout the entire room. Here intelligence shows its creativity, and for the first time in the history of civilization, we encounter an acoustic space. The sound energy coming from above defines a space - an acoustic space. It must be remembered that for Sinan's design there is no application without a reason. For many years, historians have sought the answer to the question "after creating a total space, why did he put the muezzin's mahfil right in the centre". Now we can easily say; "The answer is to create an acoustic space".